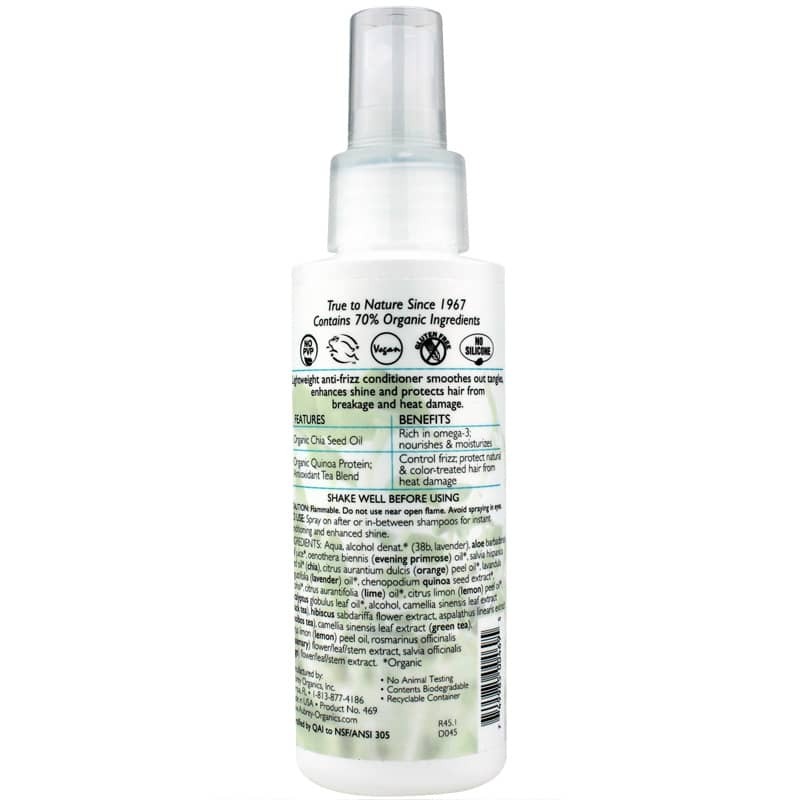 When environmental changes or heat damage from styling products cause your hair to frizz, using a spray conditioner like Chia Detangler from Aubrey Organics may help to smooth tangles, maintain shine and support overall healthy looking hair. This product is suitable for all hair types, including color-treated or heat-styled hair. Organic chia seed oil contains omega-3 essential fatty acids that nourish hair with hydration support. Rich in other botanical-based nutrients, Chia Detangler also contains oils from evening primrose, lavender, lime, orange and lemon peels, as well as extracts from aloe, quinoa seed, eucalyptus, hibiscus flower, rosemary and sage for elegant shine and smoothing support. Chia Detangler also promotes hair clarifying properties with refreshing green tea, black tea and rooibos tea extracts. This triple antioxidant blend is ideal for supporting against damage from color treatment and heat from styling products. 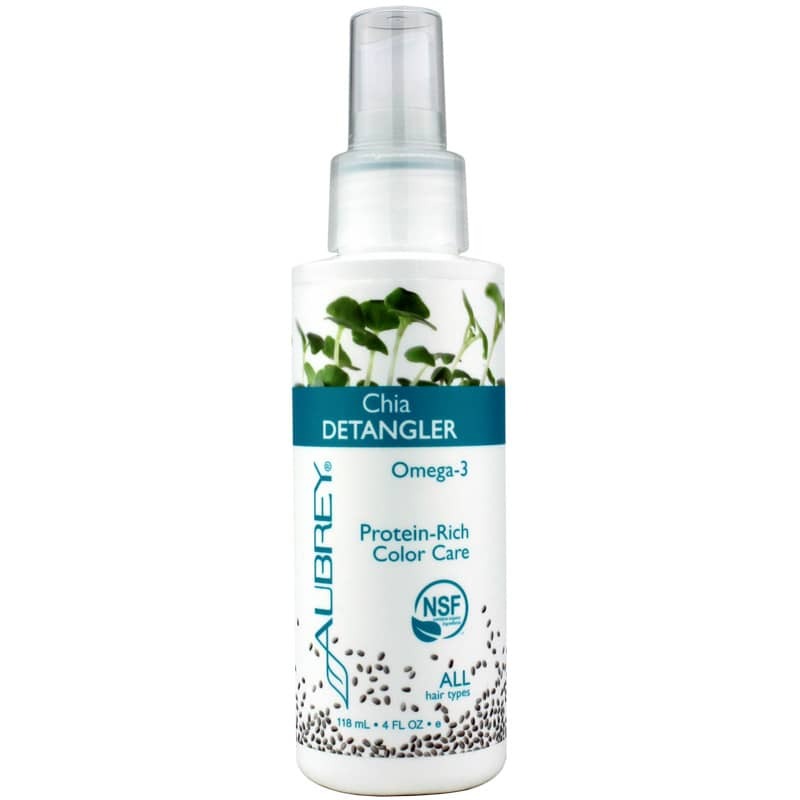 If you’re looking for a botanical-based conditioning spray to support and maintain hair’s natural smoothness, shine, strength and color, try Chia Detangler from Aubrey Organics! Aqua, alcohol denat. * (38b, lavender), aloe barbadensis leaf juice*, oenothera biennis (evening primrose) oil*, salvia hispanica seed oil* (chia), citrus aurantium dulcis (orange) peel oil*, lavandula angustifolia (lavender) oil*, chenopodium quinoa seed extract*, alcohol*, citrus aurantifolia (lime) oil*, citrus limon (lemon) peel oil*, eucalyptus globulus leaf oil*, alcohol, camellia sinensis leaf extract (black tea), hibiscus sabdariffa flower extract, aspalathus linearis extract (rooibos tea), camellia sinensis leaf extract (green tea), citrus limon (lemon) peel oil, rosmarinus officinalis (rosemary) flower/leaf/stem extract, salvia officinalis (sage) flower/leaf/stem extract. Shake well before using. Spray on after or in-between shampoos for instant conditioning and enhanced shine. This is a pretty good detangler, neutral scent and helps. Does the job! Nice detangler, it works great and has a neutral scent!